All white gold rings are rhodium plated at the factory. Rhodium plating means a super white plating is electrically bonded over your gold. Gold tends to want to be yellow. Even when they make white gold the gold will tone and turn yellowish over time. People don't realize that the ring can look brand new like the day you bought it by just getting it rhodium plated. 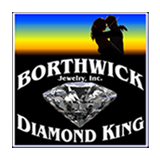 Rings bought from Borthwick Jewelry get a free rhodium plating during your free ring cleaning. If the ring is not bought from us, for a small charge we can rhodium plate your ring and make it look brand new like the day you bought it.